It was an easy 1-day jaunt from Playas del Coco to Quepos, Costa Rica. Philippe and I settled into the anchorage right around Punta Quepos, where the water was mostly flat and the depth varied a lot with the tides. Our navigation guides, along with several other cruiser’s blogs, warned us of the exposed rocks at low tide, and it was quite alarming to see their jagged edges peeking above the water surface a couple times per day. The food here wasn’t actually very good, but Philippe definitely needed a picture with the sign! “Barba roja” means “red beard” in Spanish. We were the only boat there for our entire stay. When we first dropped anchor, a young couple kayaked over to us from a local resort and came aboard for a drink. It’s always fun to meet new people and show off the boat! Yuki keeping dry with Untangled anchored in the background. The beach landing was a little rough, especially if we didn’t time it for high tide. The coastline is rocky, and although we got to drag the dinghy onto the sandy beach at high tide, it was uncomfortable and rough on Untethered to drag it over the rocks at low tide. 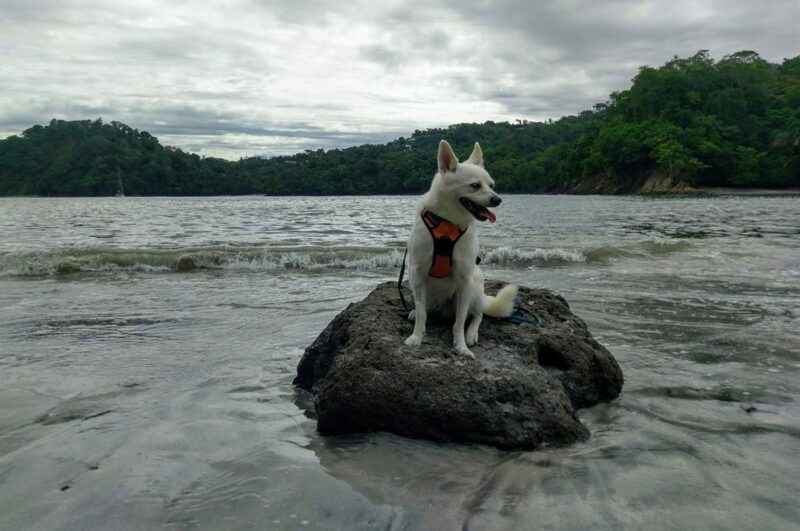 As usual, Yuki loved getting to shore every day. There was a safe location to lock the dinghy, and we always felt secure leaving it on the tourist beach. People would often stop to ask us about our trip (“Is that your boat out there? !”), so it was fun to tell our story and make some new acquaintances. After landing the dinghy, we’d walk about 5-10 minutes up a short jungle path, and then another 20-30 minutes along the road to reach the Selina hostel & coworking space. It was a great spot: they loved Yuki, they had air conditioning, and they only charged $5/day for coworking because they were renovating (normally the cost is $10/day). In a surprising turn of events, Philippe picked up some biotech consulting work and has been loving the intellectual stimulation and conversations with colleagues. Yuki loving life on shore!! Enjoying the cool evening air on deck. In the tourist area near the beach, we ate great pizza at La Lambretta, had decent Mediterranean food with SV Sugar Shack at the Manuel Antonio Falafel Bar (sadly, they were on the hard and getting repairs after their boat was struck by lightening), and enjoyed the gigantic chicken wings and dozens of sauce choices at Bar Jolly Roger. We also spent some time in town, which was about a 20 minute bus ride from the tourist area. In town, we ate NYC-style bagels at the Brooklyn Bakery, had a great Tica meal at Soda Sanchez, and bought overpriced Frank’s Hot Sauce that Philippe was so excited to restock. As you can tell, one of our favorite parts of traveling is the food. The best part about Quepos, though, was Manuel Antonio National Park. The park itself is small, so we were able to walk all of the trails on a Saturday in about five hours. We got there right as the park was opening, which was the right choice. It was nice to have a few trails to ourselves, and we got to check out the famous beaches before they were crowded with people. We saw lots of monkeys, two sloths, a poison dart frog, leaf cutter ants, crabs, and lots of iguanas. I’m sure we would have spotted more if we’d hired a guide, but we enjoyed walking the park at our own pace and having a little solitude.